Dear Mrs. Herzig, I am here for you. So, here goes! 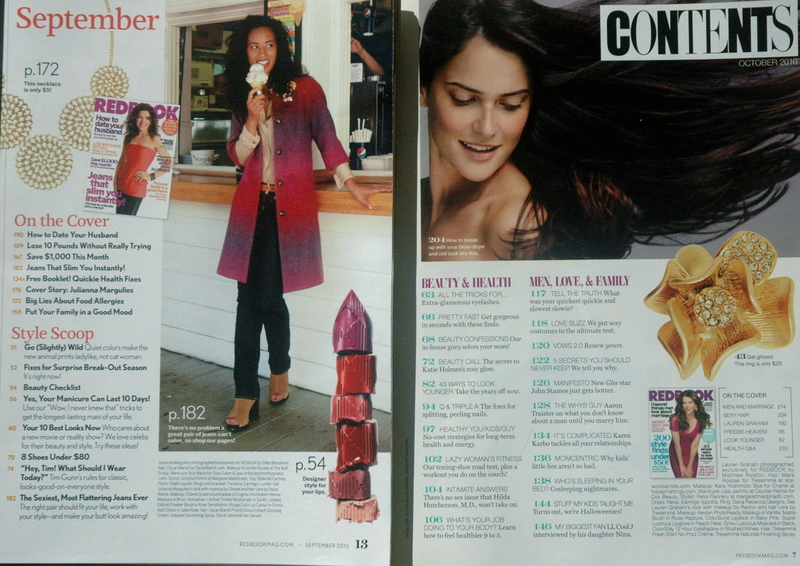 In all photos, the prior issue (September) is on the left, and the redesign issue (October) is on the right. You can click on any photo to make it larger. Each section below is ruled a Fail, Pass or Win. If Herzig and staff wanted to get comments from readers on the redesign, they should have done something new with the cover. It’s only an OCD like me who would notice the “Live Your Life” removal; the cover would have been a great opportunity to kick off the big change and guarantee notice by more readers. However, the newsstand is a fragile animal, and if Redbook’s staff members felt that their combination was magical as it was, then I get it. The cover was good before and it’s good now. But it definitely does not signal a major redesign. 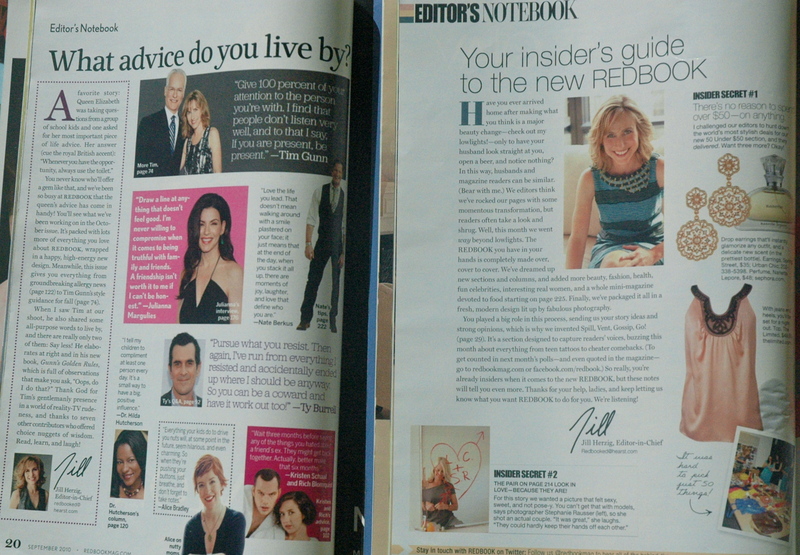 Redbook condensed its contents from 2 2/3 pages to 2 pages. The emphasis is now off the article titles and on the page numbers, which makes it hard to find articles that are of interest to reader — it’s more work to go through the contents. The font is harder to read in the redesign, too, from the section names to the article titles. It’s so much work, in fact, to get through these contents pages, that many readers will just skip it and opt to flip around until they find what they want. The new design brings the poor editor out of a hidden corner of a page to her own page with a few accessories added (in this case, they’re Insider Secrets). The photo is light-years better (I think the original photo was taken in 1982), and the design is open, welcoming and eye-catching. The Good To Eat section is completely new; the old magazine included a couple of recipes, but not a cooking/dining section. The opening short-item department, Just In Time, was replaced by Spill Vent Gossip Go!, changing the content from quick fixes (cook chicken in 15 minutes, give yourself a makeover) to a more interactive reader polls section. 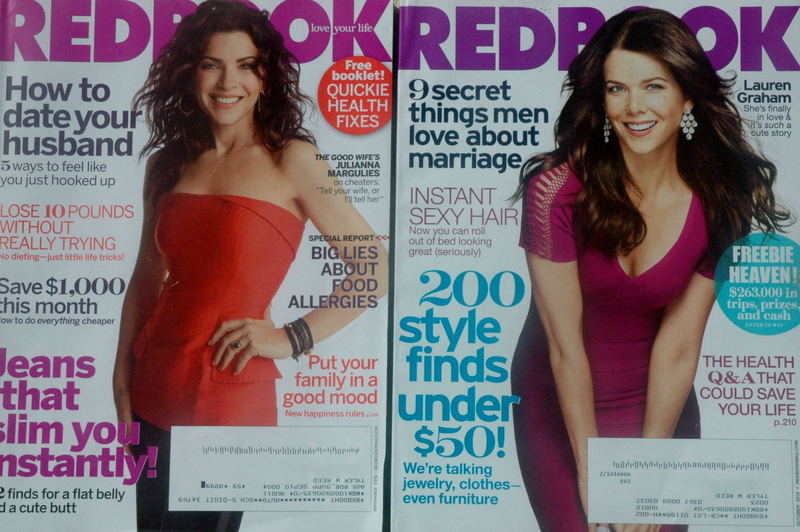 My familiarity with Redbook is admittedly low, so it’s not easy to judge the features based on these two issues. 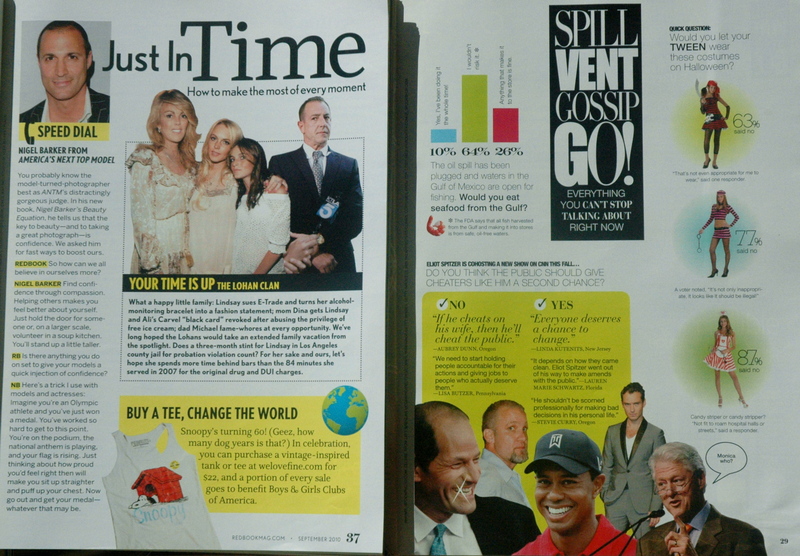 I don’t know how similar all the previous issues’ cover stories resembled the Julianna Margulies spread, and how similar the upcoming ones will be to the Lauren Graham spread. But the Margulies spread is clearly more dramatic, with only the deckhead on the opener, whereas the Graham spread introduces the first two paragraphs. The inside of the features is the same, though. There were a lot of good changes throughout, but there wasn’t anything that blew me away. 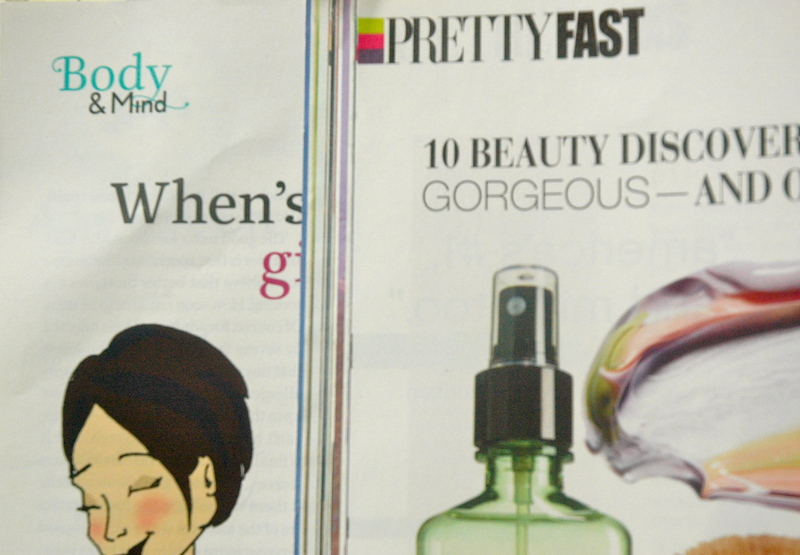 Redbook’s readers will surely be pleased — at least, the ones who notice will! What do you think? Have you seen the new design? If you’d like to keep reading, check out what two other websites have had to say about it: MediaWeek and MagaScene.